By coincidence but following on beautifully from the last post, I've received a question by email this week about dressing mixture. 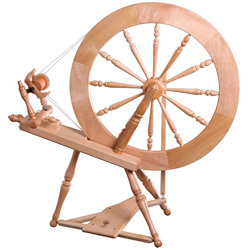 If you find spinning easier with a little grease still present but your fleece is very dry after scouring, you can spray it with an oily mixture called dressing mixture. She says that the ammonia may not be easy to obtain from your chemist, and this may be the reason that this particular recipe doesn't appear in the current Ashford book of Hand Spinning - it keeps two simpler oil / water recipes. pour the the liquids into a plant sprayer and shake up well to make an emulsion. My friend's tips are to spray sparingly and to spray the fleece at least a day before spinning (but note that the mixture may become rancid over a long period of time). Try using 1 part hair conditioner to 3 parts water. I find it works well and washes out easily, leaving the yarn soft and smelling sweet.